Brazil has strong environmental laws, but there are few practical cases up till now where these laws have been asserted. In Mexico the laws may not favor compensation because the system requires that a tortfeasor are given a chance to fixes the damages they caused before compensation can be demanded from victims. In Canada the chances may be better than in the U.S. where joint and common liability is unlikely to be affirmed by U.S. courts. This information comes from a book “Climate Change Liability – Transnational Law and Practice”, edited by Richard Lord, Silke Goldberg, Lavanya Rajamani and Jutta Brunée, Cambridge University Press, Cambridge 2012, ISBN 978-1-107-67366-3. This book was released at the end of 2011, just before the Durban summit. To our knowledge, this is the first book comparing the law of different national systems under the aspect of climate change liability, the major topic of this blog. It has been written by more than 40 authors and is of good average quality. Accordingly, we present the content of this book quite in detail. When doing so, we focus on one of the two types of liability: private liability (discarding public liability). We summarise the various contributions in a view of indicating the chances of victims of climate change to sue successfully polluters. For some of the states examined in the book, our summary is very short, regardless of the length of the original text. The first blog entry focused on the general conclusions the authors draw from the detailed investigation. The second blog entry presented the chapters on Australia, China, India, Indonesia and Japan. The third blog entry presented the legal situation for Egypt, Israel, Kenya and South Africa. 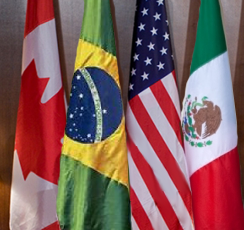 This Fourth blog entry deals with Brazil, Canada, Mexico and the United States. Liability on a non-fault basis: Brazil has a strong non-fault based liability for environmental damages. This liability is enshrined in Article 225 § 3 of the Brazilian Constitution, Article 927 of the Brazilian Civil Code (Código Civil) and Article 4 Section VII and Article 14 § 1 of Law No. 6938 of 1981 (615-617). The practice, however, seems to be different: “As part of the search for an equivalent compensation, the lawsuits turn into long disputes, which do not allow for quick and satisfactory results for the truly disadvantaged, thus favouring the perpetrators of the damage” (618). Public Civil Actions: Law No. 7347 of 1985 provides for a specific liability tool, aiming at compensation of environmental damages caused by a forbidden act or omission (619, 620). Negligence: Negligence is given if harm was caused as a result of unreasonable acts or omissions (543). The defendant must have had a duty of care to the plaintiff (543). The harm must have been reasonably foreseeable; this is the case when the defendant should have had “the plaintiff in contemplation as being affected” (543). In this context, the courts apply a criterion of proximity: “is the relationship one where the imposition of legal liability for the wrongdoer's actions is appropriate?” (544, FN 81). The plaintiff may argue that the case falls under an existing type of negligence to demonstrate proximity (544). S/he may also argue that a new type of negligence should be recognised (544). The categories of negligence are not limited, thus new types can be developed (543). However, the authors state that establishing proximity “would likely be a crucial challenge”. The defendant must have failed to fulfil this duty (543) or standard of care (544). The standard of care is based on what can be expected from “an ordinary, reasonable and prudent person in the same circumstances”. The standard of care is influenced by the likelihood of a known or foreseeable harm, the gravity of the harm and the effort needed to prevent the harm (545). Conspiracy: Conspiracy is given if there is (1) an agreement between several persons, (2) an unlawful activity, (3) a damage and (4) either an intent or a known likelihood of the damage to occur (545). Conspiracy can give rise to punitive damages (545). Private nuisance: Private nuisance is defined as “the unreasonable interference with the use of land” and does not require a duty of care and negligence in general (546). Strict liability: Strict liability refers to the “non-natural use of land” which causes the escape of something that causes harm and is regarded as a flexible concept (546). Provincial legislation: Some provinces ban the release of substances that cause damage to the environment unless they are authorised (552). For substantial non-authorised GHG emissions, this offers another pathway (552). Causation: Beyond the classic causality (“factual causation” or “but-for”- test), Canadian courts recognize the “material contribution test”. They assume causality if it is impossible for the plaintiff to prove causation in the normal way, whereas the damage is “within the ambit of the risk created by the defendant's breach of the defendant's duty of care to the plaintiff” (547, 548). Joint and common liability: It is unclear whether Canadian courts would assume a joint and several liability or whether they would follow the U.S. Market share doctrine (548, 549). Limitation: Provinces have set-up different time limitations (549). Comment: Chances to get compensation seem at least to be better than in the U.S.
Mexican law recognises both fault liability and strict liability, the latter being linked to a dangerous activity (637). The author regards it as difficult to prove the causality chain between a certain human behaviour and climate change and between climate change and the individual damage (639). Furthermore, limitation issues would make it difficult for plaintiffs (640). Compensation can only be requested if restoration is impossible (641). Public nuisance: Public nuisance is given where there is an “unreasonable interference with a right common to the general public” (580), a test which is “infamously malleable” and thus giving rise to a case-by-case decision making practice (580). The infringed right must be public, but the harm has to be individualised (580). No fault is required (580). Instead of giving much indication on the various substantial questions which could be raised in this context, the authors describe primarily the 4 famous climate litigation cases of the U.S. history so far, and most prominently the case AEP v. Connecticut. In that case, the Supreme Court hold that the Clean Air Act provides the Environmental Protection Agency EPA with the power to regulate GHG and “that the EPA was exercising that authority” (583). “This displaced the federal common law of nuisance” (583). By a 4:4 decision, the court rejected the argument that some of the plaintiffs might have a State status which would allow to challenge EPA's refusal to regulate GHG (584); the 9th judge was recused (583). The authors claim that this 4:4 decision might not be the end of the story for state public nuisance claims against GHG emissions; but “there might be a 5-4 majority against any kinds of GHG nuisance claims (and maybe other kinds of GHG claims) by non-states” (584). Furthermore the judges left the question open whether the public nuisance law of one of the U.S. states is precluded as well (584), wherefore plaintiffs might forum shop (look for the most appropriate place) both in a view of the state laws and the various court districts or “circuits” (585). Preclusion of public nuisance by an authorising state law has been confirmed, in a non-GHG case, in a decision of the Fourth Circuit (585); and “On 17 June 2011, Governor Rick Perry of Texas signed a Bill providing that companies sued for nuisance or trespass for GHG emissions would have an affirmative defence if those companies were in substantial compliance with their environmental permits” (585; State Bill 875 to be codified at Tex. Water Code Ann. § 7.257). Whilst injunctive claims in the U.S. might now shift (and why not?) to the undergrowth of the different states, the door of nuisance claims at federal level might get opened again if the Congress was to reduce EPA's competence for GHG without banning federal common law nuisance claims (586). Furthermore, and this is most important for this blog, the question is still open whether compensation claims are bared in the same way as injunctive claims (586). This question might pop-up soon with “Village of Kivalina v. Exxon Mobil” which was put on hold due to the AEP case. The newly filed “Comer v. Murphy Oil” might provide for another occasion to decide on this question (586). Is there a preclusion by the “Political question doctrine” (590, 592)? How would causality be interpreted, given that there is a multitude of GHG emitters (586, 591, 592)? What would be the appropriate share for each plaintiff and each defendant (586, 591)? Comment: To judge from these lines, from other publications on the U.S. and from the general trend in most if not all Anglo-Saxon/common law countries, a joint and common liability for GHG emissions is unlikely to be stated by U.S. courts. If this assumption was to be right and if the authors are right in pointing to the many open questions, we might be tempted to conclude that quite some non-U.S. Jurisdictions, and even those of the two neighbours of the U.S.; could offer more interesting opportunities than the U.S. jurisdiction(s). This conclusion might even be valid for victims of climate change in the U.S. They are not bared from suing CO2 polluters in the most promising countries of the European Union.